I confess I never used a row counter before. I considered it to be a useless gadget that only distracts from knitting. Instead I used to count selvage stitches on a side of my knitted fabric and multiply that number by two to get the number of rows I've already made. That task became more difficult with every row and by the time I had to shape armholes or neckline I had to count the rows several times. Then I came up with one difficult project that involved a lot of shaping and decided to give a row counter a try. Otherwise I would be counting rows more than knitting. So I put a row counter on one of my working needles and tried to remember to add one row to it every time I turned my work. It worked like magic. I didn't have to count rows manually anymore and thus finished the project (a wedding dress for a Barbie doll) much faster. Now I am going to use row counter every time I knit - it saves a load of time! 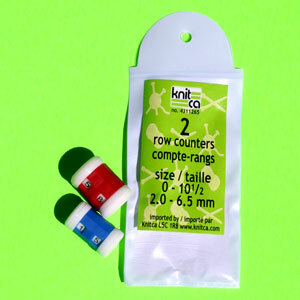 If you decide to do the same, you can find a set of 2 row counters (a smaller and a bigger one for different sizes of knitting needles) at http://www.knitca.com/.